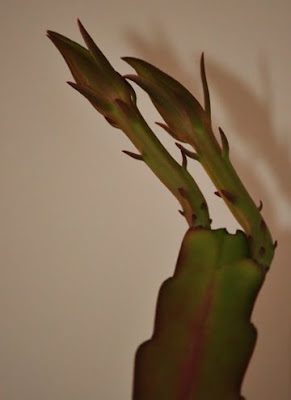 These are the last two buds on the night blooming cereus. This is the first bud that bloomed back in August. The bud looked like the ones above for about a day, and then grew another 6 inches in like 2 days and then bloomed after that. These have been stuck like this for about 10 days. Lack of light and now it's cold and it just rained for 5 days. Hopefully this plant can get it's final hurrah and will bloom sometime in the next 10 days or so.